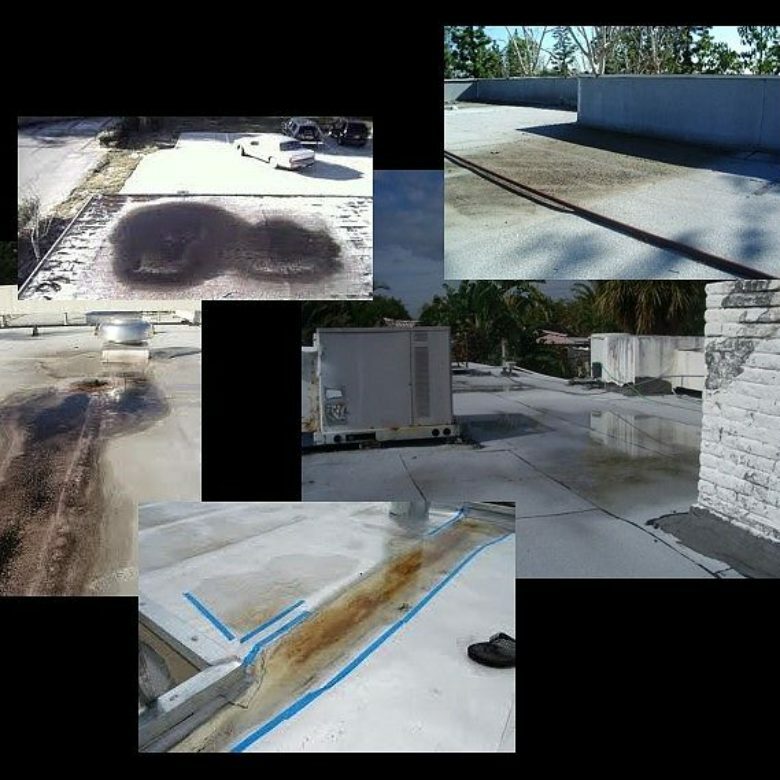 If they are not dealt with in an effective and timely manner, low spots in a flat commercial roof can lead to damage, leaks, and expensive repairs. So, how do you know if you have a low spot? What are the signs that there is a low spot on your roof? Flat roofs are actually built with a slight incline, so that water runs off immediately into the drainage system or off of the edge of the roof. 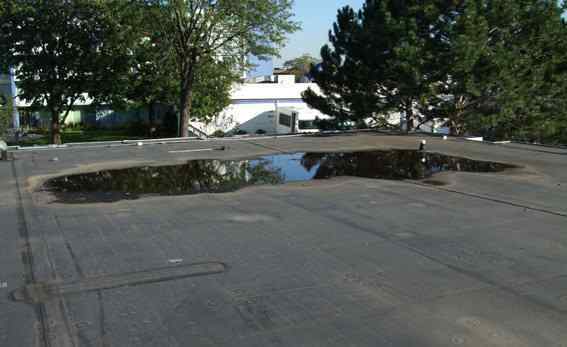 One of the earliest and easiest to notice signs that your roof is getting a low spot is ponding or pooling water. When the water does not run off the roof after a rainfall but collects to make puddles, this is called ponding and it means that you have low spots. 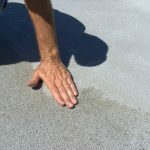 When water collects and stands in puddles, it causes wear on the roof that will eventually make leaks and soft spots, leading to costly repairs. The weight causes the spots to get deeper and can damage or break the supports and roofing materials. The water serves to focus UV light, causing materials to wear out more quickly from sun damage. If you are not up on your roof during or immediately after a rainfall, you might not see the puddles before they dry. However, they do leave signs behind – a series of rings on the roof that show where the puddles were. The rings are caused by sediment and dirt that were suspended in the water. As they slowly dry, they leave these deposits behind. 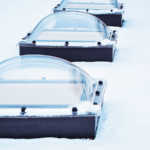 Drainage systems that are clogged often collect water. The strain of the water weight can cause a low spot to form near or around the clogged drain. You should regularly check your drains to be sure that they are not obstructed by leaves, sticks, animal nests, litter, or other detritus. If you notice a clogged drain, clean it out and check to see if water now drains properly, or if a low spot has developed. Low spots provide some protection from wind and gravity, allowing dirt, leaves, and other flotsam to collect. If you are looking at your roof and notice a wide spot that has more dirt and leaves, almost looking like a puddle of dust, that could be a low spot. You need to have it checked, as the dirt has weight and can scour roofs, water can collect the same spots the dirt is and cause water damage. You might even notice green in these spots – if the dirt and moisture collect long enough, seeds that blow in and collect in the moist dirt could grow. There can be signs inside the building that something is not right on the roof. Since low spots often lead to leakage, signs of water damage on the ceiling inside are often are the signal that there is a low spot on the roof, collecting water that has leaked inside. This means that damage is already occurring, and you need to fix it immediately. Another sign of a possible low spot that is visible on the inside of the building is mold growth. If you see black mold growing on your ceiling, or smell mold or rot, moisture is collecting from somewhere. Check the roof for puddles and water damage. Fortunately, since signs of low spots are obvious if you check regularly, you are often able to catch the problem before it causes a lot of damage. There are a variety of methods available to fix the issue of a low spot on your roof. 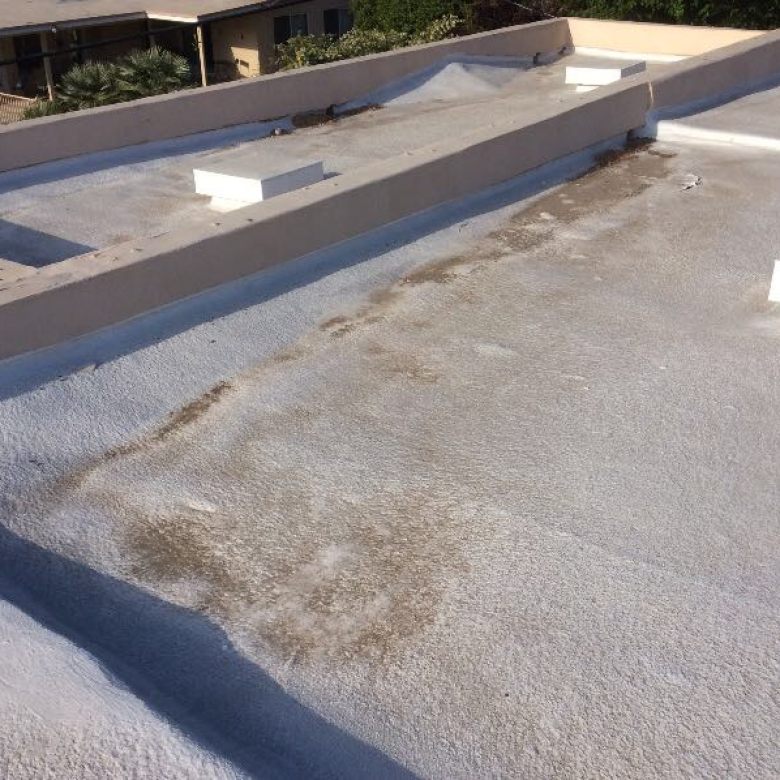 Contact Roofslope for assistance; we have the supplies and the expertise to help you maintain your flat-roofed building.